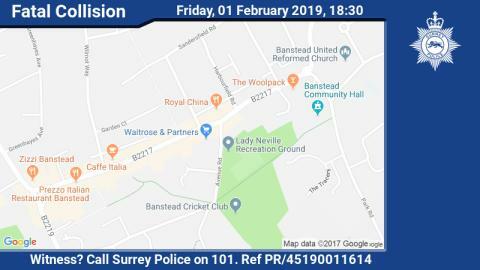 Emergency service crews were called to a collision between a pedestrian and a silver Mazda in Banstead High Street (close to Waitrose and Subway) at 18:30. Sadly the pedestrian, a man in his 60's, was declared dead at the scene. His family have been informed. The High Street is likely to remain closed to traffic until the late evening while officers work at the scene. We would like to speak to anyone who saw the collision, or may have dashcam, helmetcam or CCTV footage from the location in the moments leading up to the incident. Anyone with information should contact Surrey Police on 101 (999 in an emergency) or http://surrey.police.uk/TellUsMore, quoting reference PR/45190011614.